Another chapter in what is fast becoming the book, "How my blog changed my life"! It is 8 months since I first noticed an email from Catherine Sanchez in my inbox. In case you are not in the know, she is the esteemed editor of Australian Homespun. She asked, "Would you be interested in creating a project for our magazine"? I answered, "Oh my! Are you kidding me? I'll give it my best shot". Catherine: "Could you make me a sewing machine cover"? Bloom (aside): "Yikes, how on earth will I do that"? Bloom, faking confidence: "Sure Catherine, I'll give it my best shot"! You can pinch me now! I decided to use a linen/cotton blend, which was perhaps a mistake as it looks a bit crinkled. But it does combine really well with almost any fabric range. Having all the confidence of an L-plater in Pitt Street, I made the cover twice, once in 'Hope Valley' by Denyse Schmidt for Freespirit, and again in 'Martinique' by 3 Sisters for Moda. I made these using 5" charm squares. The cute twill 'measuring tape' came from Hatched & Patched. 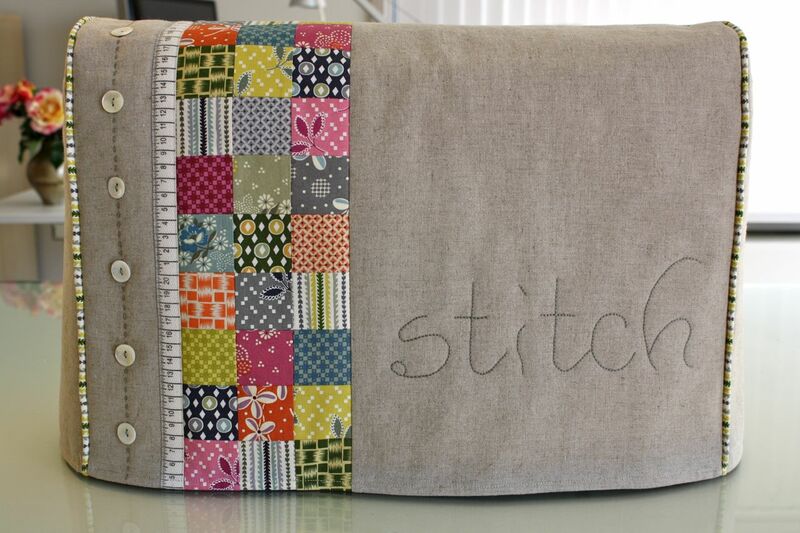 There will be a follow up project in January, which has a sewing mat, thread keeper & pincushion to match. There are some great projects from other bloggers in this special issue of Homespun, including a gorgeous 'cathedral window' cushion from Lisa at A Spoonful of Sugar, the sweetest appliquéd tea towels from Janelle, a very cute 'mouse house' from Rosie Quinlan, and a special feature on Corrie of Retromummy and Kellie of Don't Look Now. Wow, I am in amazing company, huh! To celebrate my Homespun debut, I have a copy of the 10th Birthday Celebration Edition of Homespun to give away. Leave a comment on this post, and I will draw a winner over a glass of champagne on Friday evening! Congratulations! You did an amazing job, I love it! Wow! Congratulations! So wonderful to see local designers and crafters in print. Thank you for a lovely project. I received my machine for my 15th birthday from my mum and am now 36. The plastic cover has certainly seen better days. You have inspired me.......(I had never thought of making one...). What a fabulous project and I love the look of the linen on these machine covers! Might have to go out and buy the mag if I don't win!! Congratulations! The project looks wonderful, both versions. Congratulations! That's a great sewing machine cover!! Congratulations on your project in Homespun! It's a beautiful sewing machine cover! Congratulations! I was excited to see that You had this wonderful project published! I'm not sure how I can find this in the US but I'm going to try! Thanks for a chance to win a copy! Perhaps I'll be lucky! Congratulations on being published! I like your design - simple but with loads of impact and easily customizable to any decorating style. To answer another comment, in the US I've found Australian Homespun at Barnes & Noble in the craft magazines section. Just lovely. Congratulations on being published. I'm very excited for you. Isn't blogging the best! Your cover is gorgeous! I love the Hope Valley one! Amazing job on the magazine. The postie has just delivered my copy of Homespun and I just wanted to congratulate you on such a beautiful project! Congratulations the cover looks just gorgeous - I love the Hope Valley! Pinch you! Pick Me. I would LOVE to win. Great Job! What good ideas! Count me in on the draw, I particularly love the Martinique version of the cover. Wow, gorgeous project! I love mixing linen with prints. The results are always so yummy! Congratulations all round! Love your sewing machine cover. Wow - congratulations!! And what a gorgeous project!! Today I was in spotlight and they have ribbon in the scapbook section with BLOOM on it...very nice to. Your cover is Gorgeous.I think I need to make one for my machine as it is near the window andwhen the window is open in the summer the dust gets in. Congratulations and the design is wonderful..... if my number comes up please redraw as I have the magazine..... it is my monthly luxury item!! I so hope I could find this magazine near my place, it looks full of good things! (and I was thinking of making a machine cover these days) THank you for such a great inspiration! Great projects and wonderful designs! Well done!!!! I love the little button and embroidery details. Guau! Very good project! Congratulatons! My copy arrived in the mail yesterday and I was tickled pink to see so many bloggy friends in print. Love your project; it's so attractive and looks smart too. Congratulations - these projects are wonderful, I just love them. If I don't win, I will skip out on Saturday and buy a copy. Well done!! What a funky sewing machine cover - a really modern hip and gorgeous one! Clever girl! I can't wait to see a copy! Yay! Congratulations...it looks like a fabulous cover and much better than any yukky plastic one that comes with one's machine. Please count me in...I'd loved to make one of those! WOW!!! I need to get my hands on that magazine. i think the linen blends beautifully and the Hope Valley has never looked so good. Well done! Congratulations! I love your blog and anything that you stitch! PS: I'm using one of your free pics for my desktop..the Bird sitting on the Gate ..I Love looking at it.Thanks. I am just in awe! 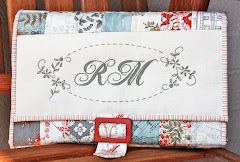 These are such fun and fabulous ways to showcase some of my favorite fabrics! Congrats on being published, how exciting!! I love your project, I desperately need to make a sewing machine cover but have been waiting for the right one, now I have no excuse!! Congratulations! These pieces are amazing. I do hope I win. This magazine is hit or miss at our bookstore here in Michigan, U.S. So I would love to have a copy! Really beautiful projects. I love the little pincushion. I think I'll take a stroll to the newsagent tomorrow. Love your project! I really need to make that machine cover. 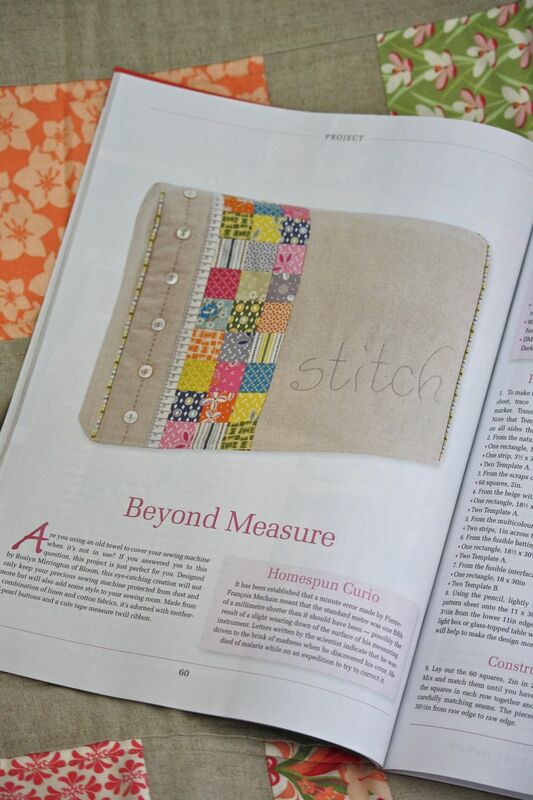 Some of my FAVOURITE people are in this edition of Homespun, that includes you Sweetie/aka Muriel :) Congratulations on getting your pattern in print. Your projects are ever so lovely. Congratulations!!! This project is so beautiful. Love the fabrics you have choose too. It has to be exciting to see your work in a magazine. Cool! Yipee! You're famous! Might have to get my mum to buy me one a copy. I was just thinking the other day I really need to make myself a machine cover, as I dusted the craft room (first time in months, poor machine). Your project is beautiful! Congratulations. Congratulations! The machine cover is gorgeous. The cover looks wonderful as do the other projects in the issue. It would be wonderful to have a piece of Australia visit my home. Congratulations. Both covers are fabulous. Can't wait to see the mag. here in the states. CONGRATS ON A NEAT JOB WELL DONE! I love your sewing machine cover, such clean lines. I wouldn't know which one to choose. Your project looks simply beautiful and I would love to win the issue with your pattern in it. Having another magazine title to review for my blog would also be great! I just love your pattern and CONGRATULATIONS what you make is so worthy of publication. I can only hope I could make it well enough to do such justice. I would love to win your extra copy it is very hard to find in the US and even upon finding it they are at least 2 issues behind. Either way I am just thrilled to follow your blog and see what next inspiration you will come up with. Love everything you do! Hopefully they will continue to request creations by you for publication. Hooray for you! WOW congratulations, that is soo cool! Your sewingmachine cover is beautiful- I love it in both the fabriclines you used, and the papemeasure ribbon is just to die for! I would love to be in the draw- this is a MUST HAVE magazine! Nice job. I love the handstiching - I never think to add that but it makes all the difference. congrats...lovely project, well done! Love both colour ways, they look amazing. Congratulations. Love the projects. What fun!!! Wow! Congratulations Ros, these are absolutely beautiful & we also have January to look forward to! You sure do keep excellent company. Congratulations - that looks like a very achievable project. sewing machine cover I have ever seen ! I didn't know you were giving away a prize, but I just had to tell you that it is gorgeous!! I love the different color options and the "STITCH" and I love how you combined the linen with the cotton. It is so fun and pretty! Congrats!! I LOVE the gorgeous cover!! 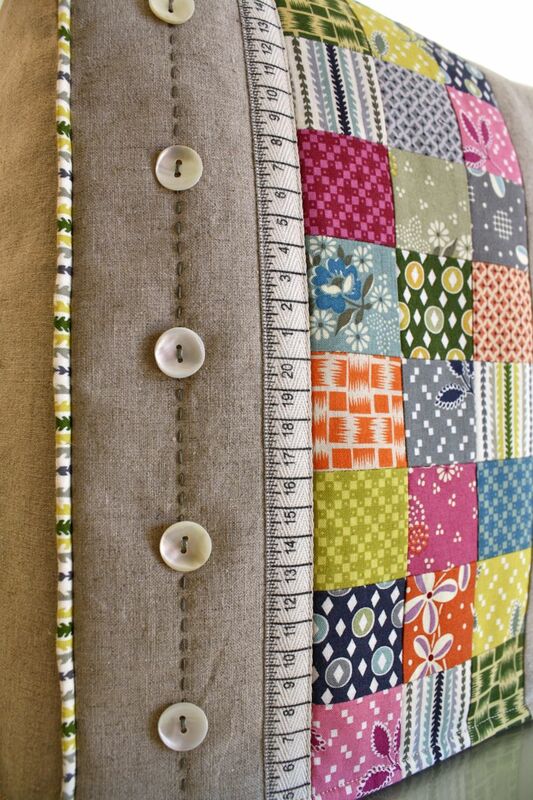 The buttons and the linen are perfect!! Thanks for the chance to win a Homespun magazine!! Take care and congratulations! What a lovely honour! The sewing machine covers are awesome!! Congrats. to you!!! That has to be a great feeling!! Thanks for the giveaway as well!! Just want to say thank you for the giveaway offer and your sewing machine covers are just perfect. I love your choice of fabric, colours and stitching. They're among the best I've seen. I especially love the 'Hope Valley' one because I've just got some of this fabric too. Congrats and Well done.... You deserve the champange! Well done... truly lovely. I haven't bought any p/w mags for ages, but I will buy this one for sure. Congratulations! How exciting to have your project published in my favourite magazine! It looks a great sewing machine cover which I would be tempted to make . Please add me to your Giveaway! And congratulations that your cover is being published - that's great! Congratulations on being included in this special issue of this lovely magazine! I really love all the details you've added to these sewing accessories and love the pairing of the linen and the patterned fabrics. Congratulations on your beautiful pattern. Love the look of your sewing room accessories. Really beautiful. Will look out for the homespun mag. Looks fabulous. i think I definately have to make one of these! Congratulations! Congratulations. 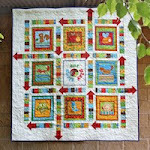 I love the way so many blog pals are featured in Homespun. It's like a club newsletter where we all know each other. Oh I love that cover done with the martinique. That is beautiful. Congratulations, your machine covers are beautiful! I'd love to win a copy of the magazine as I have such a hard time finding it over here! I love it! Your creation is beautiful! Congratulations on being published. Congratulation on being published - the sewing machine cover is gorgeous. Love HOMESPUN - please add me to your giveaway list. 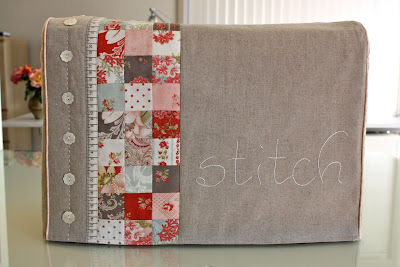 Your sewing machine cover is wonderful! I'd love to have this copy of Homespun. If I don't win it, I'll have to try to find myself a copy. I would love to make that coolcover for my new sewing machine but as I live in Ireland I am unlikely to have access to a copy of Homespun ...unless I win of course! Well done on the look of your covers I love the linen combined with the patterned fabrics. These are phenomenally gorgeous!! I can't stop looking at these photos-- I love the colors and the details and everything about these-- I aspire to make such lovely things out of my fabric! I am just sitting here drooling! gorgeous stuff there!!! Congratulations on you being published with your beautiful work!!! Thank you so much for the chance at your SWEET giveaway!!! Oh what a cute sewing machine cover! I want one for my sewing machine. And the matching pin cushion & thread catcher are the perfect set. Thanks for the chance to win the magazine. What does the cover for this one look like? Big congrats to you !!!! Would love a chance to win !! 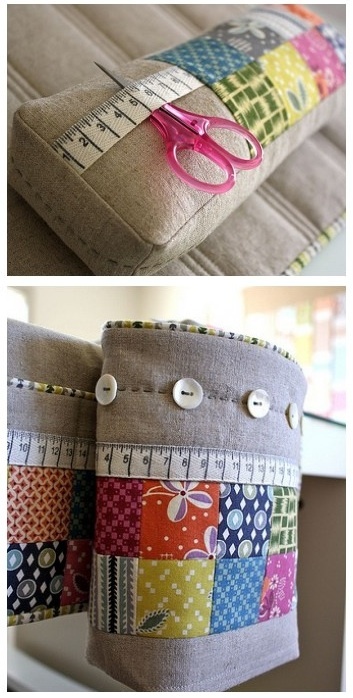 Absolutely cute and lovely sewing machine cover! Great work! Wow - that is one pretty cover. I love it! Could you send me a link to where I might buy this in the states? I've been looking for a pattern like this for my new machine. It's lovely AND perfect! Yes, please, I would love my name in this drawing. Still a winner. I first saw this on Pinterest. Love this!! The linen blend is beautiful with the charms! Love that twill tape, too! Fabulous job and congratulations on being published. Your projects are super cute. Love your sewing machine cover. Would love to make one for my machine. Have not heard of that magazine here in the States so I hope I can win a copy! Wow! That is gorgeous! I don't have a clue to where I can get a copy of this magazine as I am in the states. But, I'm going to look online! Beautiful projects! I think you gave it more than a "shot" you nailed it!! 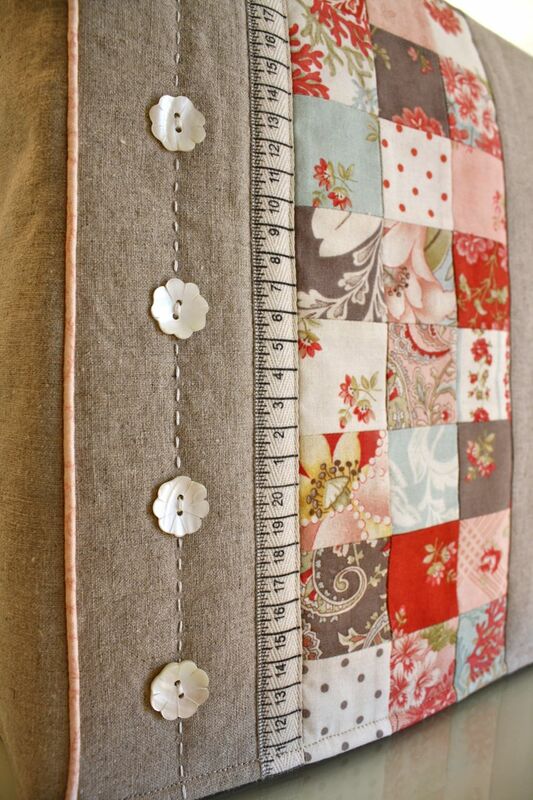 Can't wait to see your mat and thread catcher pattern, I could use one of those also!! Congrats on being published. Oh how lovely to be able to create such a pretty pattern. Congrats on being published. It's the linen. We all love seeing the texture. That pincushion-phenomenal! 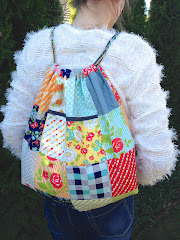 This is great and love the crinkle and colors, I was trying to find the twill tape too? But no luck, can you give me a direct link?? Hope you haven't had your wine yet because I really want you to draw my name! What a beautiful creation for the magazine - congratulations on your beautiful work. Oh, please pick me! I have been wanting to make a cover for my machine and Hope Valley is just perfect! Even if I don't win I will be hunting down a copy for myself! Great job! I love this sewing machine cover, and I wanted to let you know that. I also wanted to let you know that I'm having a $65 vintage fabric giveaway on my blog. Hi, is there any possibility of either obtaining a pattern for your lovely sewing machine cover or the article itself? I'm also writing to Homespun but the costs for shipping to the US are astronomical! I would also be very interested in the entire matching collection. It's stunning.